Suzanne Kaksonen and her cockatoo Buddy camp at a makeshift shelter outside a Walmart in Chico, Calif. on Wednesday. 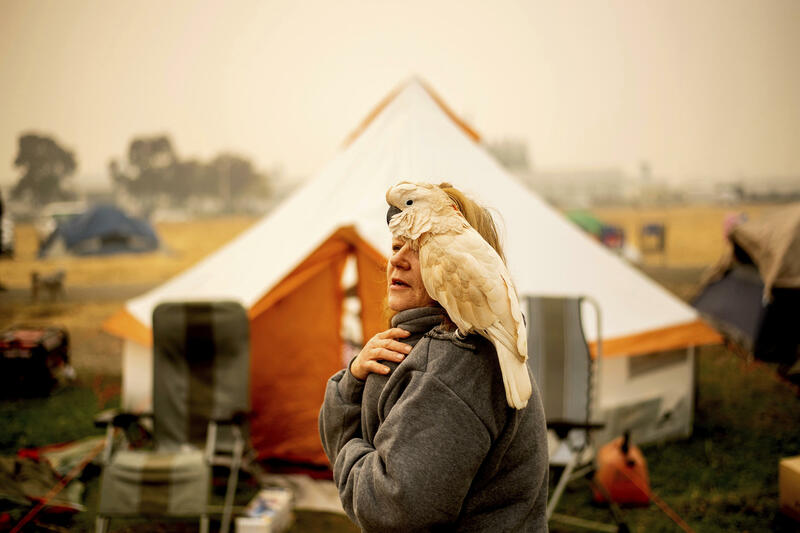 Kaksonen, a resident of Paradise, lost her home in the blaze. Members of the California Army National Guard put on protective suits before searching for victims of the Camp Fire in Paradise, Calif., on Wednesday. A fire truck drives through an area burned by the Camp Fire in Paradise on Tuesday. The Butte County Sheriff's Office said Thursday morning that the list of the missing had grown to more than 300 people. Days after the flames swept through Paradise, dense smoke still hangs over this town whose residents are mostly gone. They fled to nearby towns along traffic-choked roads leading away from the small California community that was popular with retirees. Some residents didn't make it out. 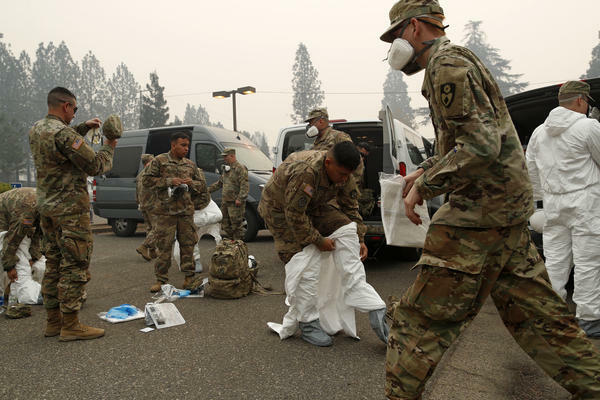 Authorities say at least 56 people died in the Northern California wildfire known as the Camp Fire, which has burned through at least 215 square miles of land and consumed Paradise. Others are still missing, though official numbers have fluctuated wildly. The Butte County Sheriff's Office said late Wednesday that 130 people were missing; on Thursday morning, the list had grown to more than 300. Over the last few decades, Paradise grew somewhat haphazardly — a place where you could find affordable housing in a state where that's hard to come by. As the town expanded, more houses were built in a landscape known to be fire-prone. They enter neighborhoods marked by an eerie quiet. The houses there have been incinerated. "Nothing left," he told NPR's David Greene. "Basically just a bunch of rubble and metal everywhere. Cars wasted. Personal belongings completely gone. I basically got out with the clothes on my back and my pickup. That's all I have." "We knew it was coming," Gaebe said. "Everybody's been saying for years, when this town goes up, it's going up. And it went up." "We had a very robust evacuation plan," she said. "We used that plan, and I think it saved hundreds of lives because we had practiced it. We even took one of our peak morning hours and made the road a contraflow, so we could show our citizens how it was going to work. What happened, though, is typically you are evacuating a zone or two or three zones. You're not evacuating an entire town all at the same time." 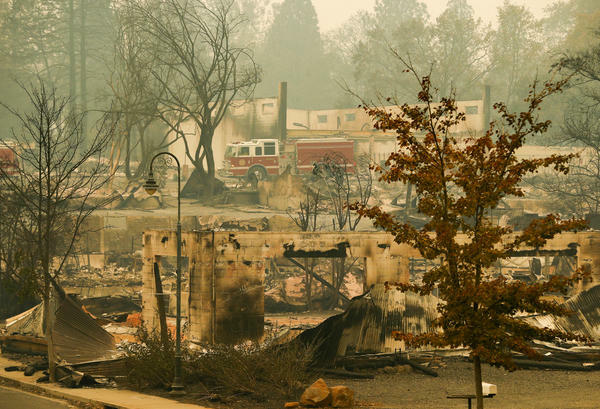 Jones estimated that 90 percent of the town's residential buildings have been destroyed. Now, she said, Paradise looks "like a war zone." "I would say about 90 percent of the homes in the residential neighborhoods are gone," she said. "Now, the business district, I would say, is more like 50 percent." "I think that possibly we could have done more education of people. If you have a landline, you automatically receive those calls that say 'evacuate immediately.' If you have a cellphone, you had to register them. Maybe we could have done better there 'cause I've heard from a lot of people who did not get those messages on their cellphones. And it's probably because they didn't register." 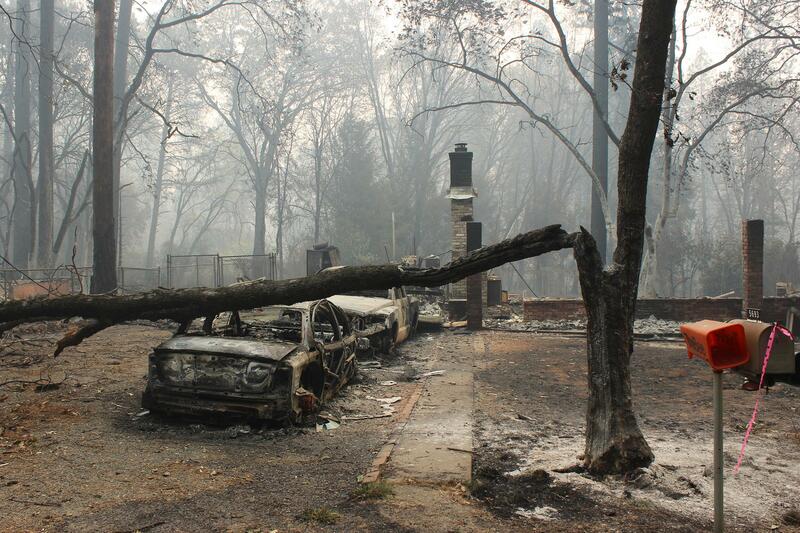 Many of the town's residents are now at shelters in nearby Chico. Others have set up camp in a Walmart parking lot, where they are living in tents. One man there said a woman had invited him to go into the store with her and paid for what he needed — a sleeping bag, a tent. It's not clear yet how many of town's 27,000 residents will return and rebuild. So much of Paradise lies in ashes. And then there's the possibility of another fire. "We still have conditions that could produce new and damaging fires," Ken Pimlott, director of the California Department of Forestry and Fire Protection, told Reuters late Wednesday. "We are not letting our eye off this ball at all." Hundreds of Texas firefighters will start heading to California on Monday morning to help battle wildfires burning in Southern California.